There are many types of arthritis; two major groups of these types are rheumatoid arthritis and seronegative arthritis. While we may be most familiar with rheumatoid arthritis, and often consider all forms of arthritis to fall within that category, seronegative arthritis is something different. Seronegative arthritis is actually a collection of several different types of arthritis. What these types have in common is that the Rheumatoid Factor (RF) is absent, and does not show up in blood tests as it would in all cases of rheumatoid arthritis. Differences - While rheumatoid arthritis affects primarily the joints, seronegative arthritis has a number of different, and sometimes seemingly unrelated symptoms. With only an occasional exception, seronegative arthritis affects only males. There also appears to be a strong genetic link involved as seronegative arthritis has a tendency to run in families. Unlike rheumatoid arthritis, seronegative arthritis often affects more than just the joints, extending to inflammation of tendon attach points, and often damaging cartilage. Symptoms of seronegative arthritis can also be observed in the skin as psoriasis, the eyes and the bowels. The larger joints, often just a single joint, tend to be affected more than many smaller joints. Seronegative arthritis is fairly common, affecting just under 130 out of every 100, 000 people. While this may seem like numbers associated with an epidemic, the vast majority of cases of this kind of arthritis have mild or even unnoticed symptoms, and when symptoms do appear they often are not easily recognized as having anything to do with arthritis, back pain or sore feet being two examples. Back pain is actually the most common manifestation of seronegative arthritis. It may be mild and recurring infrequently. If the condition becomes severe however, and is not treated, the affected individual could eventually find himself or herself in a situation of having a fixed forward bending posture. One group within the umbrella of seronegative arthritis types is referred to as reactive arthritis. In these cases, the arthritis appears to result form some other disorder in the body, and the symptoms often seem unrelated and therefore difficult to diagnose. In its most commonly experienced form, reactive arthritis involves the urinary tract, the eyes, and the skin as well as joints. Seronegative Arthritis - Seronegative arthritis can at times be symmetric, that is affecting joints on both sides of the body. When this is the case, approximately half of the people affected become to some extent disabled. When the disease is asymmetric, it tends to be much milder, and usually only affects only a very few different joints. The most destructive type of seronegative arthritis is arthritis mutilans, which is usually quite severe to the point of being deforming. Only a small percentage of people are ever affected with this type. Since all of these types are the result of inflammation, treatment involves controlling, or where possible reducing, inflammation. Reactive Arthritis - A subset of seronegative arthritis types is reactive arthritis. 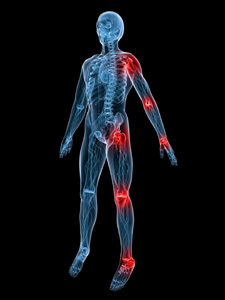 Reactive arthritis is arthritis triggered by a disorder somewhere in the body, or an infection. While the joints are ultimately affected, early symptoms very often involve the urinary tract, the skin (especially the feet), and the eyes. A burning sensation when urinating, and a need for more frequent urination are two symptoms. A rash at the sides of, or bottoms of the feet is another. About half the people affected will experience eye discomfort. It's easy to see that if only one of these symptoms is being experienced, arthritis would seem to be the last thing one would expect to be at the source of the problem. If all symptoms are there however, it is very likely a case of reactive arthritis that is involved. Reactive arthritis may be mild and only experienced over a short term. It can also be progressive or become chronic. Since this type of arthritis is triggered by some other condition, the underlying condition usually needs to be determined as part of the treatment. While some people may experience recurring attacks over the years, most who have reactive arthritis are able to lead normal and productive lives.